There are two schools when it comes to cherry clafoutis. 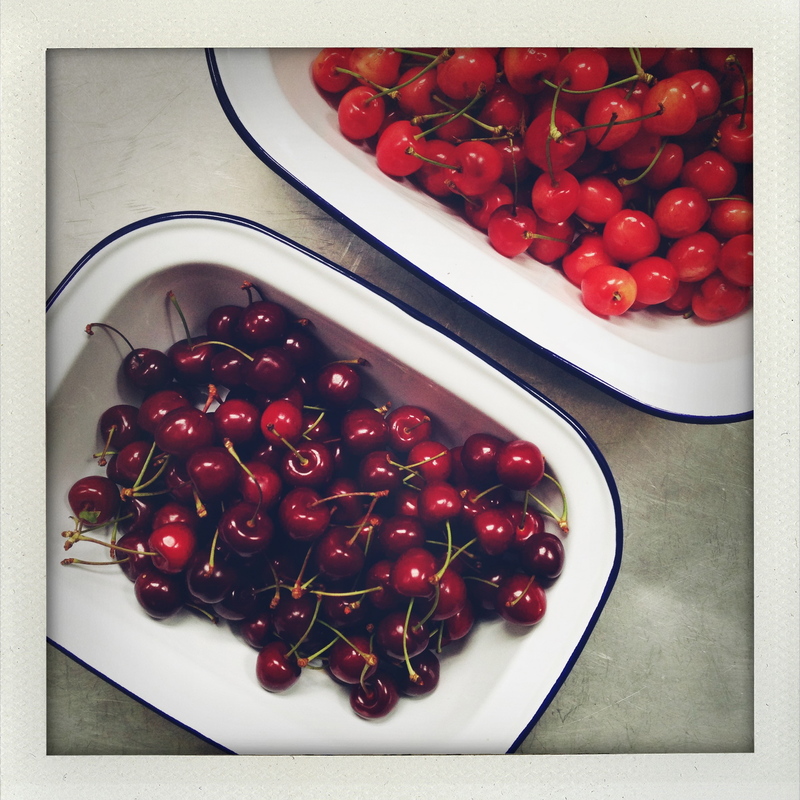 Those who pit the cherries, and those who don’t. I like not to, because it allows the clafoutis to be ready for the oven in just a few minutes, because the pits reputedly impart flavor, and because I don’t mind removing the pits with each mouthful. It prolongs the enjoyment. Thomas, on the other hand, is adamantly against pits. Indignant. How can I? Never mind that a clafoutis has miraculously materialized within the 15-minute half-time break of Brazil vs Chile. Still, he insists, had he known, he himself would have pitted the cherries. Pits are polarizing. The good news is, one way or another, at the end of the day, there is cake — who is to complain? Certainly not the one who surreptitiously finished the last remaining piece to which I had been looking forward throughout all of Colombia vs Uruguay. 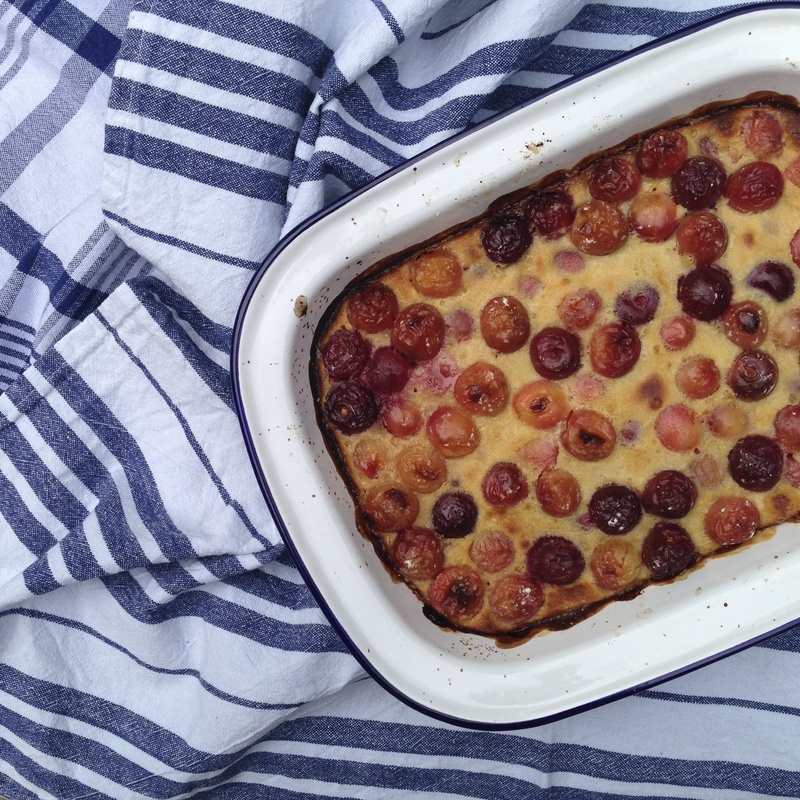 Practically any fruit can go into a clafoutis, but for me the craving springs with the seasons’ first cherries. Sour cherries even better. But no matter the fruit. Pulling up in her ageless navy blue Renault 4L, my father’s fairy godmother Lily never arrived with fewer than one or two cakes, crates of homemade jams, and, always, little boxes of cotignac. But ask anyone in the family, Lily is practically synonymous with clafoutis. And, many years ago, she gave me the recipe! Beat the ingredients together and pour over the fruit in an ovenproof dish. As far as I remember, Lily always left the cherry pits. Perhaps that is why, to me, clafoutis if foremost cherry, with pits. I have tried to leave the recipe, in its masterful simplicity, intact, but I’ve translated to more precise measurements and added my two cents in parentheses. If using apples, pears, apricots, plums, or peaches: brown the washed or pealed, cored, and quartered fruit in a large skillet with a generous pad of butter and sprinkling of sugar until golden brown. Set aside. If using cherries, pit them. Or not. Place the fruit in the dish, sprinkle with a tablespoon of flour, and toss gently to dust the fruit. In a mixing bowl, whisk the eggs and sugar until frothy. Add the milk, then the flour, salt, and whiskey (or kirsch).